There are all sorts of gimmicks and training aids in the field of dog training. So many that in schooling shows for horses they often have a “gimmick” class. This is a class where the horse can be shown with his training gear in use. In dogs a similar class is known as Sub-Novice. Similar in that one form of training gear is used in the ring – the leash. In managing dogs we have had a wide variety of Bells & Whistles, gimmicks, or training aids. They may all be appropriate in some situations, one or two are appropriate in most situations. Let’s try and sort through the options. Training aids are divided into four major categories. Physical restraint, sound, taste and electrical stimulation. Most of us are familiar with physical restraint. Collars and leashes, muzzles, head halters and harnesses. Baby gates for doors. For everyday wear a leather or nylon color of a size and weight appropriate to the dog and a 4-6” leather of fabric leash are basic. For active training a chain or nylon training collar is added. The collar should fit easily over the head and should not have over 2-3” of slack when on the dog’s neck. Other options are the newer alternatives, electric collars or the head halter. In my experience halters have been very humane and effective, especially with the larger dogs. Head halters are not to be confused with muzzles, the only similarity is that they are both worn on the head. Sound Devices are usually used for barking and boundary offences. They are usually very effective early on in their use but the effectiveness diminishes with time. Early in the training process they are an effective deterrent. A dog or cat indulges in the unwanted behavior, i.e. barking, getting on the sofa, going beyond bounds, and the animal is bombarded with a loud and unpleasant sound. This startles the dog and interrupts his/her unwanted behavior. As the animal becomes accustomed to the noise, its effectiveness diminishes. Sometimes the astute owner can take advantage of the momentary distraction to reward the dog for stopping the offensive behavior, thereby teaching the dog to stop. The taste trainers are the substances that taste bad so the dog leaves the articles alone. Taste trainers are usually used for chewing. The electrical stimulation training devises are very powerful tools. They are the most effective. One caution however, is that they are easy to misuse. The very fact that they are effective means that they need a knowledgeable operator. Some of these electronic products correct, automatically, the undesirable behavior. A bark collar or an electronic boundary system – those are great! They never falsely correct yet provide swift and sure correction for misbehavior. The quality of the product you choose is paramount The old saying about there being nothing man cannot make a little worse and sell a little cheaper definitely applies here. Be very sure of your supplier. 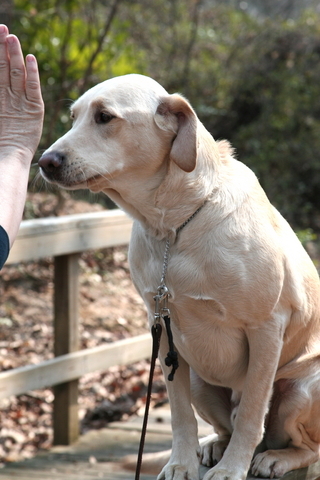 The hand held or handler-controlled devices are also very effective. There is nothing better for long distance control. There is a great potential for misuse. A correction overdone or mistimed can cause harm. The very effectiveness of this type of unit is it’s greatest strength and it’s greatest weakness. Use this type of device carefully, follow the directions or consult an expert. All of the various bells and whistles have their place. Most can be used or abused. When in doubt, consult an experienced trainer about the effective use of any product.